Recognised as a global leader in customer service excellence, iiNet is Australia’s second largest DSL Internet Service Provider (ISP) and the leading challenger in a competitive telecommunications market. Publicly listed on the ASX 200, the billion-dollar ISP maintains its own broadband network and supports over 1.7 million broadband, telephony and Internet Protocol TV (IPTV) services nationwide, and is committed to making it simple for Australians to connect to the internet. Its vision is to lead the market with services that harness the full potential of the internet, while differentiating itself through award-winning customer service. Working in close partnership with Merchants for over six years, iiNet‘s continued business growth and expanded service range meant the ISP needed to expand its resource requirements. This translated into a significant ramp up in people to support its follow-the-sun strategy and manage increased call volumes. At the same time, the solution would need to meet cost reduction objectives and achieve its strategic priority of providing an outstanding customer experience, underpinned by an unwavering commitment to measuring NPS through clear KPIs. iiNet has always been fiercely protective of its brand culture and values. Recognising the clear correlation between happy customers and happy staff, it places a strong emphasis on its people to create a culture of quality customer service. 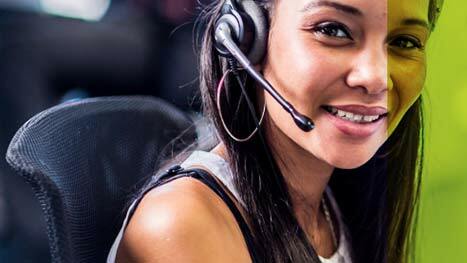 Driving customer retention through an outstanding service experience has meant that every aspect of the contact centre environment needs to mirror iiNet’s culture, brand values and identity. With 11% revenue growth year on year prompting a spike in call volumes, iiNet’s onshore operations were already at full capacity and existing facilities in South Africa were stretched. iiNet required a new, suitable environment that could support its phased expansion to 1000 people including customer service representatives and support staff. At the same time, the solution would have to meet its cost reduction aims while driving high recruitment activity over a short period of time. Throughout the process, Merchants’ robust training programme was needed to ensure consistently high quality service levels. iiNet required a new, suitable environment that could support its phased expansion to 1000 people including customer service representatives and support staff. To deliver on iiNet’s goals of a 100% ramp up over 10 months, Merchants adopted a phased approach to the recruitment and training of 520 additional customer service representatives and support staff. Through its partnership founded on a shared culture that puts people and customers first, Merchants has added value through its facilities, people and leadership programmes to offer an established support structure that manages cost pressures, without impacting the customer or staff experience. Merchants uses continual talent mapping to ensure that there are enough resources to meet growth demands. Addressing the rising need for customer service managers across the operation, and in light of limited skilled resources in the market, Merchants Future Leaders programme has provided opportunities for internal progression and development. From the outset, new recruits are aware of the clearly defined career path within iiNet and Merchants, which enables agents to progress to more senior positions or specialist skill positions across the business. In the case of tenured staff, active mentoring and performance development supports their career progress onwards. Catering for a largely young workforce, the new building incorporates themed interaction areas, dedicated game areas, music rooms, a gym area, quiet pods, and modern utilities such as mobile phone desk chargers, to name a few. All training rooms reflect iiNet’s different customers and young South African designers have been invited to showcase their work in the building in recognition of Cape Town’s title of World Design Capital 2014. The successful ramp up to 1000 people in a bespoke new facility has resulted in the extension of iiNet’s partnership contract to 2019. Effective recruitment and training programmes, which source and empower people through sustainable job creation and competency development, has seen attrition rates remain below industry norms while ensuring consistent focus on, and delivery of, quality customer service levels. The expanded contact centre mirrors onsite operations and has evolved through a mature partner relationship to include fixed line, mobile, voice, IPTV, online content, and technical hardware support. ​Operations now include sales, provisioning, billing and technical queries and fault management that includes escalations to its TIO regulator (ombudsman). iiNet’s social media capability now offers online support through online channels that include Facebook to support customer demand for wider channel access, while resolving issues to reduce the load on redirected calls to the contact centre. Regular culture surveys measure whether people feel like they can make a difference and impact customer service, and results show employee satisfaction scores are on par with onshore sites.